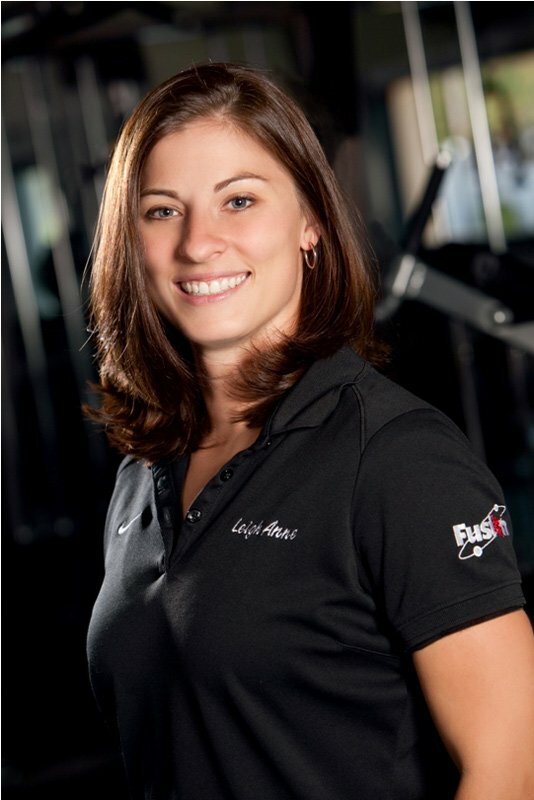 Personal Trainer Of The Month: Leigh Anne Emerich! 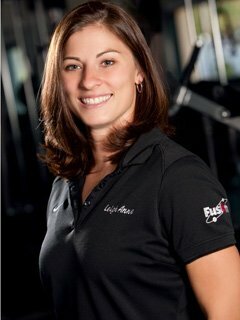 Congratulations Leigh Anne Emerich on being our Personal Trainer Of The Month! Leigh Anne was chosen for her commitment to helping her clients achieve their fitness goals! Number Of Clients: It varies but anywhere from 20 to 25 clients. Q: Could you tell us a little about your background - personally and professionally? I have been involved in sports since I was 4 years old. Soccer and Lacrosse were a major part of my life throughout middle and high school. I continued on to play lacrosse for the University of Delaware but gave it up to focus on study and work. I graduated from the University of Delaware in 2004 with a degree in Psychology. Following college I worked various jobs including several bartending positions and selling weight loss products but couldn't find a career path to follow. At age 24 while seeking a real career and a way out of an odd job career path I discovered a love of exercise and nutrition and my boyfriend urged me to try making a living doing what I loved. I decided to become a certified personal trainer with NASM. Once certified I began training friends and family in my spare time. I realized quickly that I needed to be affiliated with a gym to pursue a career in fitness so I accepted a personal training position at Fusion Fitness Center in 2008. I recently decided to expand my education and I am currently working towards a second degree in Nutrition with a major in Dietetics at the University of Delaware. Super-cute girl, powder-blue cinder block wall, kettlebell - this is the prison of our dreams. Q: When and why did you become a trainer? I became certified as a personal trainer in 2006 because I knew I wanted to work in some field of health and wanted to be able to help people feel better physically and mentally on a personal level. Q: What is your training style? What methods do you use? Understanding the busy erratic schedules of my clients I focus on a full body exercise during every workout and prefer functional and free weight training over circuit training. With new clients I start by focusing on corrective exercise to ensure all my clients fitness programs are based on a solid foundation. I work with my clients to fix any weaknesses to ensure they are proprioceptively correct before we start adding more weight or harder exercises. I prefer training against time rather than reps to ensure consistent and moderated work to rest intervals throughout the entire workout. This methodology works effectively for both individual workouts and group workouts when single session may involve participants of varying levels of fitness. Q: Do you have examples of success stories from clients using your methods? I have had several clients with major knee injuries. Following regular personal training sessions we have been able to improve their condition and/or help prevent further deterioration of the knee joints. It is very encouraging when a client reports that their doctor is happy with their training regimen and that they can see a difference in their patient's overall well being. "Drop and give me 20," doesn't sound quite so bad coming from her. Q: Who are some of your most notable clients? I am consistently impressed by all my clients. They all work so hard when they come into the gym to train with me. I get most excited though when my clients recognize the vital connection between nutrition and exercise, or they finally understand that this must be a lifestyle change for them and that diet and exercise must coexist and that you cannot succeed at one without the other. These are the clients that see the best results and are able maintain their success over time. Q: Can you please you give me an example diet and training program you put together for your clients? Fusion Fitness promotes the proprietary DotFit nutrition program and I prefer to cater my training programs to the client's individual goals but I start every client with a set of very basic moves to evaluate each new client's fitness level. This approach allows me to better understand where weaknesses are in order to modify their training program to focus on fixing their imbalances and then improve their overall conditioning. Q: What are the most common mistakes a client makes? Clients can make all kinds of mistakes when it comes to performing exercises but bad form is easily corrected. The greatest misconception clients have is to believe personal training is the "magic pill". They feel that just because they hire a personal trainer they will automatically become fit and healthy. They don't initially understand the level of effort and commitment required to achieve their health and fitness goals. Another mistake clients make is to forego proper nutrition and eating habits failing to recognize that nutrition and exercise go hand in hand. Do as I do, and as I say. Or else. Q: What are the most common mistakes you believe a trainer makes? I think the most common mistake trainers make is to neglect focusing on form. Trainers tend to teach the basics but then want to quickly move on to something more advanced. If the client does not have the proper form down they will end up hurting themselves trying to perform more advanced moves. Another mistake that I feel many trainers make is to push their deconditioned clients to do something their body is not ready to do. We must make sure that each client has rock solid base before progressing them to more weight or more difficult moves. Q: Do you set your clients up with a full diet and training plan for them to follow by themselves? I train most of my clients twice a week, so on their days away from me I tell them what they need to focus on and which days they should be resting. As for diet, I can give them some pointers and tell them what types of foods to avoid, but I am not a dietitian yet and therefore cannot in good faith provide precise nutrition advice or tell them exactly what they should be eating. Q: How do you keep your clients motivated? Motivation can be very difficult but I feel I keep my clients motivated with positive reinforcement during workouts and away from the gym by trying to teach them that regular exercise must become a part of their lives. They must learn to make time for it and include it in their daily routines if they want to see results or maintain the fitness level they have achieved. I also do my best to lead by example and practice what I preach by maintaining my personal diet and exercise regimen as much as possible. Q: Do you train a male client differently to a female? I may use more weight with a male client than with a female client, but I essentially train using the same methodologies. Everyone is trained like they are an athlete. Q: How have your changed your approach to clients over the years of experience? My training approach is always evolving. As the fitness industry changes, I try to modify my approach and keep up with the science and trends, as long as I know that they are legitimate and will be beneficial to my clients. 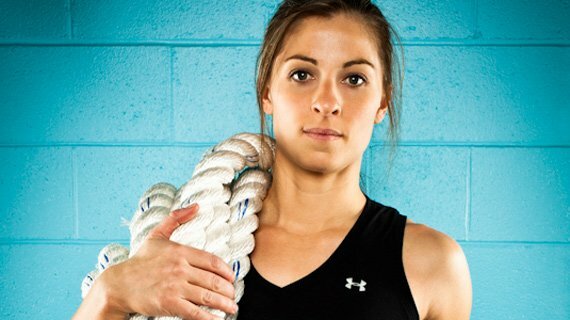 This shoulder-slung rope is not for escape - it's for serious upper-body training. Q: How do you start a client on a new program? Do you do some kind of assessment? When starting a new client I first ask about their health and if there is anything that I need to know that would prevent them from doing any exercise. From there I start on a very basic routine which helps me gauge their strengths, weaknesses and limitations in order to level set their initial training program. Q: Do you prefer to train male or female clients and why? I have no preference training a male or a female. Men tend to feel less comfortable around a female trainer or they think that I won't be able to push them because I am a female. Q: Do you feel just as much like a psychologist as you do a personal trainer? Sometimes I do, it's not a secret that many clients confide in their trainers once they get to know them but I always work to maintain a high level of professionalism. So if the discussion gets too personal or political, I usually just listen or try to change the subject. Sign Them Up For The Personal Trainer Of The Month! Do you have a personal trainer that deserves to be a Bodybuilding.com Personal Trainer of the Month? Submit them to ptmonth@bodybuilding.com. We will be highlighting a personal trainer each month. These great trainers have been successful in helping their clients succeed. Check it out!